We really enjoy going to local antiques markets, often heading to nearby Città di Castello on the third Sunday of the month. 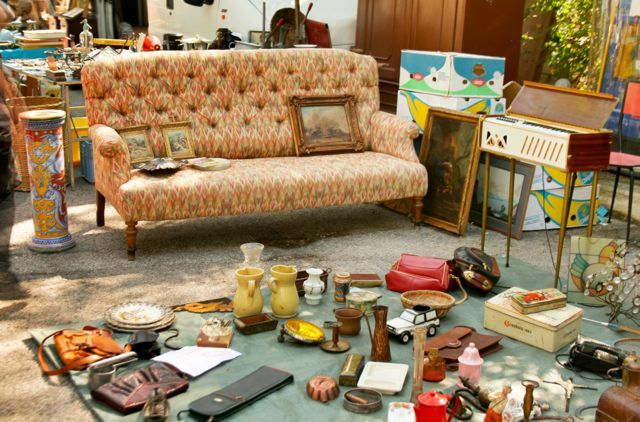 The biggest antique market in Umbria and probably one of the biggest in Italy is held in the village of Pissignano. The market is held on the first Sunday of each month and is so well known that many antique dealers from Rome attend. Pissignano is located near the town of Trevi and is next to the famous Fonti del Clitunno, the natural springs that inspired the poem describing Umbria as the “Green Heart of Italy”. The market stretches alongside the main road into Pissignano and into the centre of the village itself. It takes a while to stroll along the entire length of the market, we were advised by experienced visitors to park at the Pissignano end and make our way back along the market. There are a lot of interesting items to look at and buy, our daughters found some wonderful vintage dresses. Afterwards we had a good lunch at La Trattoria, sitting outside on the shady terrace. On the day of the market advance booking is advisable to secure a table.